Boxing seems to have been a sport that although technically illegal, increasingly became tolerated in society. This was largely due to the introduction of improvements such as Broughton's rules in 1743, and the Marquess of Queensbury's rules in 1867. However, the Western Times was still able to report in 1885 that a prize fight in Dousland on the Princetown Railway had been kept secret from the police. Above: Notice of the postponement of a boxing match ('the noble art') on Welstor Common because the police had sent for reinforcements. 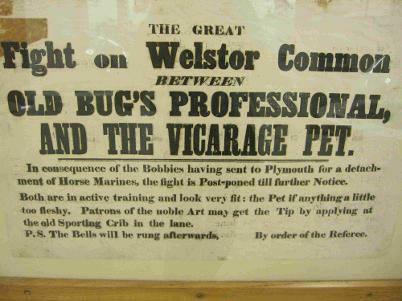 'The Great Fight on Welstor Common between Old Bug's Professional, and the Vicarage Pet. In consequence of the Bobbies having sent to Plymouth for a detachment of Horse Marines, the fight is Postponed until further notice. Both are in active training and look very fit, the Pet if anything a little too fleshy. Patrons of the noble Art may get the Tip by applying at the old Sporting Crib in the lane. April Petty Sessions, 1870. Thomas Eggbear and Thomas Paul were each ordered to pay 5s 6d for playing at football in West Street the previous month. 1887 Edwin Tucker Jnr was elected captain of a club to play under rugby rules. A club playing under association rules was in existence, but hardly ever played. Ashburton B played Haytor Vale at the Ashburton club ground. Ashburton scored one try; Haytor Vale failed to score. 1894. G Pitts, son of butcher G Pitts, broke his leg in two places when he was kicked during a football match. P.C. Mortimer took him to the Cottage Hospital. Ashburton lost to Newton Rovers in a 'spirited game.' Whiddon was the new captain of Ashburton. 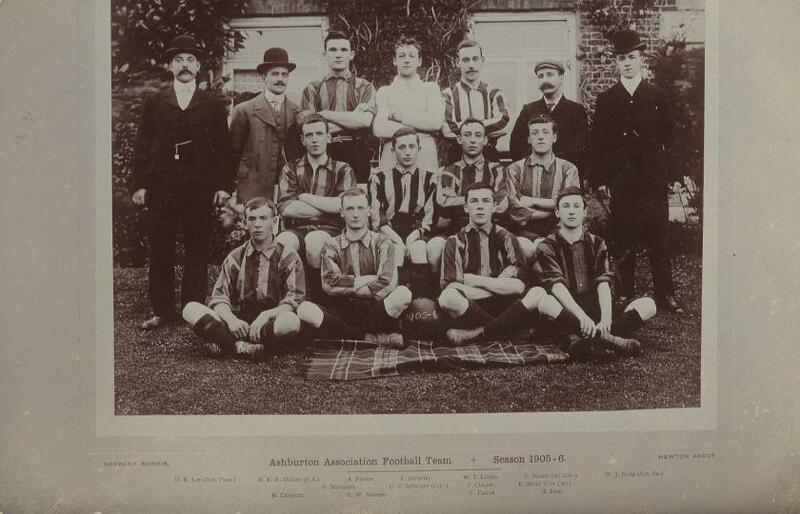 Above: Ashburton Association Football Team, 1905-06 season. In 1921 Mr H Arnold was president of the club, with G Purchase as the Hon Sec.. J A Mann and R Stacey became the new joint hon. secretaries, B Balkwill was the hon. treasurer, D Cowls the captain and J Foot the vice-captain. 1922 Ashburton AFC held its annual meeting at the Golden Lion Hotel. The deficit of 4s 11d in the balance sheet 'was considered satisfactory'. Members of the football club were amongst a large congregation at the funeral of Herbert A Blyth in 1926. He had met with an accident in a football match the previous season, which had resulted in his leg being amputated. 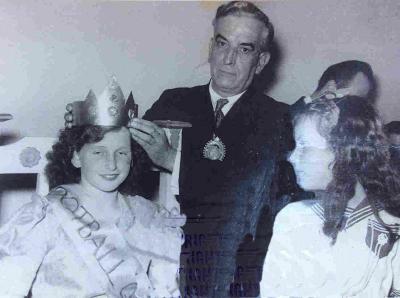 Right: Richard Arscott crowning Maureen Gregory the Football Queen (written on reverse of photograph). Many thanks to Richard and Frances Berry for this photograph. 1846 Mr R Tucker, attorney, had his front teeth displaced when he was hit in the mouth by a cricket ball. 1852 Ashburton Cricket Club played its closing match of the season, the teams being natives of Devonshire versus other parts of the world. 1878 A match was played between a team of married players and a team of single men from the club. The single men won by two wickets. 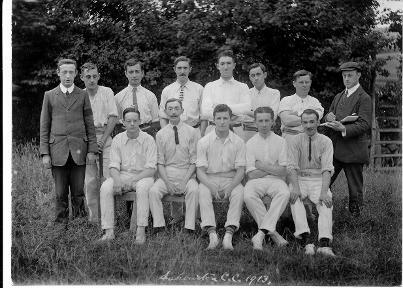 1880 The Cricket Club acquired a field at Higher Headborough Farm. Ashburton Institute played a smokers versus non-smokers game in 1886. The non-smokers won by a narrow margin. The club closed through lack of players in 1910 but in 1913 a meeting was held at the Golden Lion, with the aim of restarting it. In 1922 E(dward) M(aurice) Dowson was living at Hele. 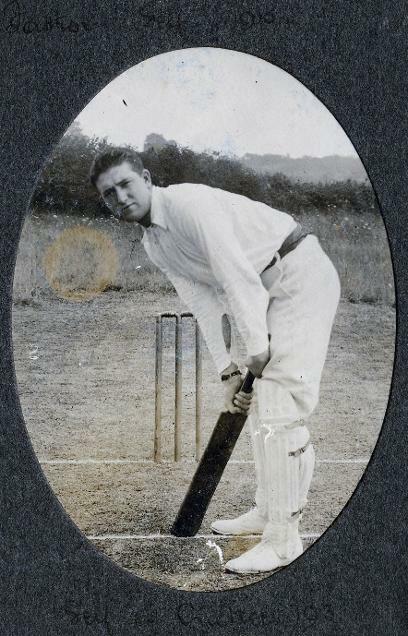 The Western Times described him as 'the brilliant Harrow, Cambridge and Surrey cricketer'. He was President of the cricket club in 1929. Before the Ashburton/Buckfastleigh match in July 1950, players and spectators stood in memory of Mr C S Caws, who had been captain of Ashburton Cricket Club. 1899 A town cricket club was launched, using a field in Balland Lane. Committee - J Clymo, J Berry, E Sawdye, J F Baker, J D Reddaway, F Edgecombe. Above left: Ashburton Cricket Club 1913. Brian Bernard Baker is the tallest player, centre back. Many thanks to Lerida Arnold for the photographs and information. James Cann, Jordan, The Webbers, Huxtable, Bolt and Frost. 1849 A wrestling match was advertised in Ashburton, with a prize of 25 sovereigns. Abraham Cann was to be in attendance. 1850 Abraham Cann, Devon Wrestling Champion, arrived in Ashburton to adjudicate in a disputed wrestling match. According to Edward Foot, writing to the Western Times in 1879, he stayed 3 days, being 'almost worshipped' by the inhabitants. For more on this visit, see the Historical visitors' book under the section Gathering together. In August of the same year, a correspondent to the Western Times said that at a recent match in Ashburton between Cornwall and Devon, Cornwall had won five of the six prizes. This was in spite of the Devonian contestants using savage kicking, whilst wearing loaded shoes and padded shins. In February 1910 a meeting was called at the Town Hall to discuss establishing a golf club in Ashburton. Mr Parnell Tucker had offered an area of land on Welstor Common at a nominal rent, and he also proposed erecting a club house, which could also be rented. The cost of laying out the course was estimated at £150, with half of that amount already promised. Several ladies had promised to subscribe to the project. The Portreeve, Mr J T Baker, chaired the meeting, with Messrs C E Robinson, F H Rogers, R B Berry, J Mortimer and R W Firth being present. A resolution to form the 'Ashburton Golf Club' was passed, and Mr Firth was appointed Hon. Secretary. The 1911 census shows Alfred Henry Jones Hobley as a boarder in John K Hamlyn's household at Welstor Farm. He was a professional golfer. In September 1911 an inquest was held at Welstor Farm on 22 year old A H Jones-Hobley. He had been out rabbiting with J K Hamlyn when his gun exploded as he pulled it out of a hedge. Mr Jones-Hobley was the professional of Ashburton Golf Club. In June 1914 a meeting was called at the Market Hall to discuss the formation of a bowls club. A committee was negotiating a ground: the field known as Maiden Bridge in Dolbeare Road near the top of East Street, owned by Mr Hoskings, could be rented for £8 per annum. The Portreeve, Mr Geo. P Foaden, presided. Ashburton lost to the home team, Teignmouth, in July 1928. In the team were: T Pascoe, G Green, T Islip, C Badcock, S Parnell, W J Hicks, J A Mann, W Mugford, A Nicholls, H Cann, E J Satterly and J Foot. In 1949 the British Legion opened a new headquarters, situated on the site which had formerly been the Ashburton Bowling Green.